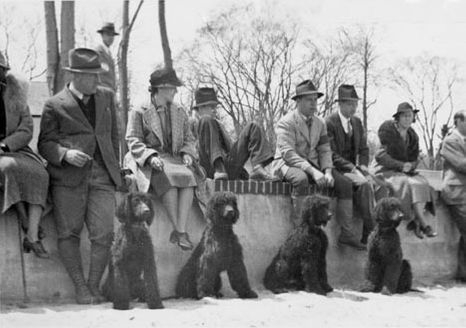 The Irish Water Spaniel Club of America was organized in 1937 by Mr. Thomas C. Marshall of Fairfield, Connecticut, and Mrs. Henry T. Hall of South Sudbury, Massachusetts. In that year the Club sponsored its first Specialty Show and the first Field Trail for Irish Water Spaniels. Mr. Marshall had Irish Water Spaniels in the 1920's. He bought them all from Percy Swan in Chico, CA. He was primarily interested in hunting, but the dogs did so well that he entered them in field trials--some of the first retriever trials in this country. He became interested in obedience when Mrs. Whitehouse Walker was introducing Obedience Trials from England into this country. Mr. Marshall was full of enthusiasm for IWS as hunting dogs and as real thinking dogs. In 1937 he trained and ran the first sporting dog to earn the CDX in Obedience tests and, with the same dog, tied for the National Obedience Test Title with three German Shepherd Dogs. The dog was his Ch. Blackwater Bog, who also placed in several Field Trials. In 1937 the Club membership of fifty represented twelve states. In the years since, membership has increased so that nearly every state is represented, as well as several foreign countries.